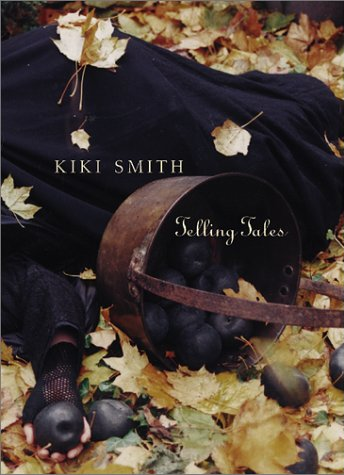 Telling Tales is a product of Smith’s personal visions on Christian creation and diverse cultural traditions. Her goal was to reinterpret the popular tales of Adam and Eve, Sleeping Beauty, and Little Red Ridding Hood in order for all humans, animals, and landscapes to coexist. Smith adds a sense of innocence and enchantment to the reinterpreted tales because they are meant to be seen through the eyes of a child. Smith alters Red Ridding Hood from naïve to fearless. The girl who was a victim of the wolf not only befriends him, but becomes his companion. The sculpture “Daughter” depicts a puzzled girl wearing a red cape and growing facial hair resembling the wolf. The characteristics and small scale of this particular piece represents a sad girl who has become an outcast due to her physical appearance. Her face is a mixture of the bearded lady seen at a circus yet the scared, and troubled look on her face shows the innocence of a young girl. The love child of Red Ridding Hood and the wolf, “Daughter” symbolizes Red’s innocence and the wolf’s wildness. Smith strives to change the viewers traditional perceptions of the heroines she depicts by emphasizing the the trials and tribulations they undergo as a rite of passage. By allowing Red Ridding Hood and the wolf coexist and create a child together, they are uniting human and animal characteristics while exploring the idea of difference. 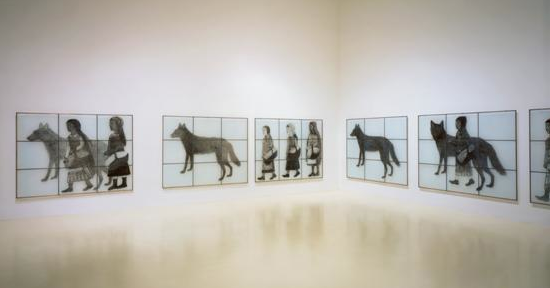 Kiki Smith, Gang of Girls and Pack of Wolves, 1999. Fired paint on glass with brass and lead. Smith further explored the ideas of difference and discrimination by creating Gang of Girls and Pack of Wolves. This piece depicts the companionship between Red and the Wolf by exposing their differences. The work is composed of a series of large scale paintings that depict young girls and wolves. Although the figures are together they give a sense of isolation allowing the viewer to feel the abandonment of being and outcast.